This promotional photo of the Madison High School production of High School Musical depicts the tug-o-war between social groups – the Jocks, the Brainiacs, and the Thespians – as the two lead actors try to navigate their feelings for each other while keeping their friendships. If the winter weather and political climate has you feeling down, consider attending live theater – and specifically a performance of the Disney stage show, High School Musical, performed by the student actors of Madison High School on the last weekend in February and first weekend in March. 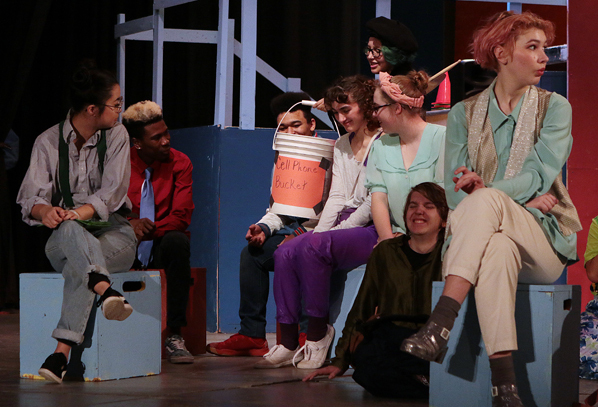 “This is a super-fun and family-friendly show, with music that appeals to all ages,” grinned Madison High’s Theater Instructor, and the show’s director, Ms. Zena. The “Wildcat Cheer Team” energizes the crowd as they prepare for the big game. “It is, quite simply, a ‘Romeo & Juliet’ story, but – with a major exception – it has a happy ending!” Zena exclaimed to East Portland News at a dress rehearsal. “Our production also invites the community to see high school from a lighter perspective; especially in a time like this, when so much tragedy has hit the high schools in our country. “We want people to remember that the youth inside those schools have a compassion and empathy for one another, despite the outside world,” Zena added. Students celebrate the first day back at school at “East High” after Winter Break – as they return to their lives of singing, dancing, academic competitions, and playing basketball. Childless adults may not be aware that High School Musical, a made-for-television movie released on January 20, 2006, as a Disney Channel Original Movie, has now been seen by an estimated 225 million viewers globally – and has since been adapted for the stage. As High School Musical unfolds, two high school juniors from rival cliques try out for the lead parts in their high school musical. Theater teacher Ms. Darbus (played by Destiny Husted) collects students’ cell phones after they’d been using them during class, resulting in all of those students being assigned detention. The “jock” Troy and “brainac” Gabriella are urged to “Stick to the Status Quo”, fighting off peer pressure and antagonism, inspiring others along the way. At the same time, the high school diva tries to sabotage their friendship, and herself be selected as the lead player in the school musical. 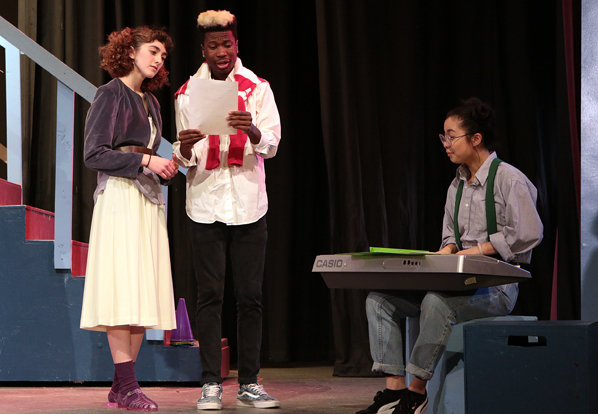 The school’s “drama diva” Sharpay (played by Amulet Reynolds) tries to discourage new student Gabriella (Bijou Holiday) from liking jock Troy (played by Gideon Nartey-Tokoli), during Science class with all of the Brainiacs. Will Troy be so distracted by Gabriella, and his secret passion for singing, that he can’t “Get’cha Head in the Game”, as a musical number suggests? What will they do, when Gabriella finds out the school’s “scholastic decathlon” takes place at the same time as Troy’s “big game” – and as the high school musical’s auditions? Or will there be a happy ending, after all? 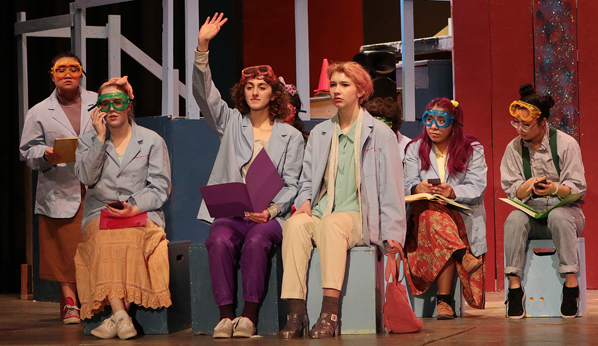 Come, see, and enjoy this lively production of High School Musical by Madison High’s theater and musical departments. Troy and Gabriella decide to try out for their high school’s musical play, accompanied by the “original music” written for the show by Kelsi (played by Stephanie Vo-Nguyen). The show features a cast of 46, backed up by 15 musicians, and the show is run by 12 stage technicians. 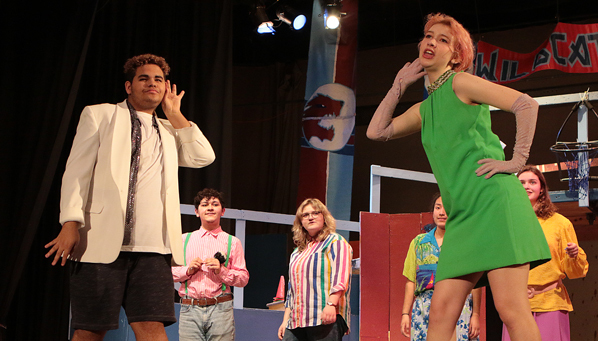 Ryan (played by Mika Mitchell), and his twin sister Sharpay, break out their best dance moves during their own audition for the lead roles in the school’s musical. 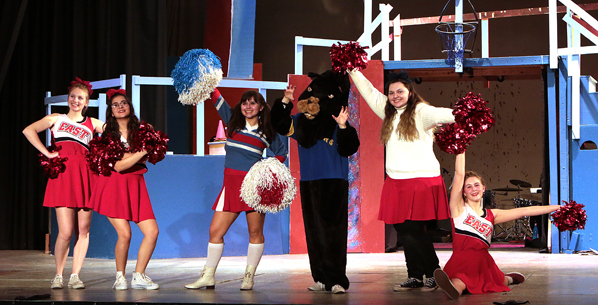 The curtain went up a day later than expected, due to snow, on High School Musical on February 23 at 7:00 p.m. It also plays at 7:00 p.m. on the weekend of March 1st and 2nd. And, there are also two Matinee shows at 2:00 p.m. on both February 24 and March 3. Tickets are available at the door: $15/Adults; $10/Seniors; and $8/Kids, 18 and under. It’s in the Hibbard Theater at Madison High School, 2735 NE 82nd Avenue, 97220. You, too, will be cheering when you see the Madison High School performance of High School Musical.